The Philadelphia 76ers were trailing the Boston Celtics for most of the first half on Wednesday night until the Sixers Joel Embiid and the Celtics Marcus Smart got into a confrontation. Embiid elbowed Smart, who fell to the floor (no call made), so Smart got up and shoved Embiid to send him flying. Smart was called for a flagrant foul and immediately ejected from the game. The Sixers gained the momentum from there and went on a 25-13 run to take the lead. 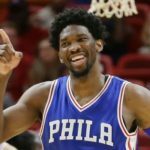 Philly won 118-115 thanks to Embiid who led the team with 37 points and 22 rebounds. Thursday at noon marks the beginning of the NCAA tournament (March Madness has officially begun). If you haven’t filled out your bracket yet, here’s some last minute help on what to watch for and which team could be this year’s Cinderella story.